Choose from the following first-time home buyer credit repayment FAQs - Form 5405. How does the death of a spouse affect repayment of the First-time Homebuyer Credit for a 2008 purchase? Use the HOME screen to enter repayment information. The repayment amount calculates based on your entries and appears on line 60b of the 1040. If the taxpayer is required to file Form 5405, page 2, the software generates it. Part III shows repayment required due to conversion to another use or sale of the principle residence. 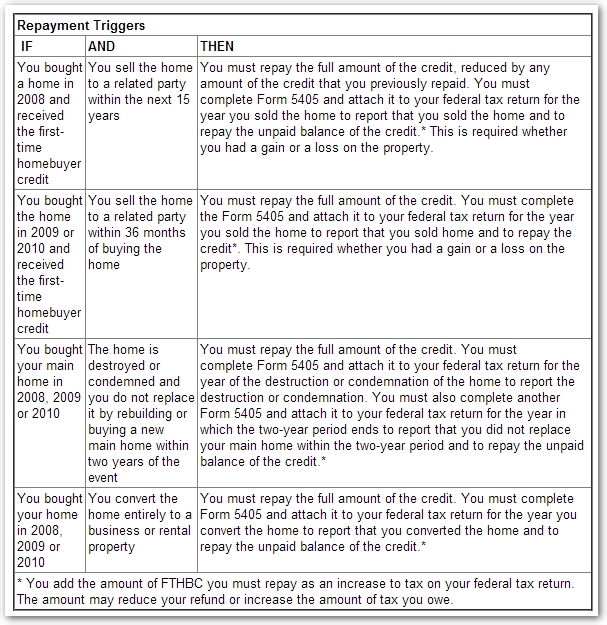 Part IV shows scheduled repayments of the credit required for a purchase in 2008. Amount of original credit repaid in prior years. 2008 was the only year for which credit repayment is required. If the original credit amount is not entered, or the original credit amount is less than the credit repaid in prior years, no repayment will be calculated. When does a taxpayer have to repay a First-Time Homebuyer Credit? Generally, the credit must be repaid over a 15-year period for a home purchased in 2008, but Credit repayment is not required for a 2009 or 2010 purchase. However, certain events may trigger a repayment obligation. See the instructions for Form 5405 and the IRS discussion below. How is the First-Time Homebuyer's Credit entered? The repayment amount for a First-time Homebuyer Credit for a 2008 purchase is 1/15th of the credit, from 2010 through 2025 (unless voluntarily paid up early). Drake calculates the payment from information on the HOME screen. The repayment appears on Schedule 4, line 60b (Form 1040, line 60b in Drake17 and prior) of the return. Form 5405 is not produced unless IRS requires it (because the taxpayer disposed of the home or ceased using it as the main home; see the Instructions for Form 5405, page 1). The repayment is calculated when you first open the HOME screen, if Drake has tracked the credit since 2008. Otherwise, the repayment is calculated from your HOME screen entries. For your returning clients whose returns have been continuously updated since the purchase, Drake tracks the credit and automatically calculates the repayment when you first open the HOME screen. The software inserts the repayment on line 60b and, if the IRS requires it, produces Form 5405, page 2. Your client's credit has been tracked if data appears in Year home purchased and Amount of credit taken. If that data is incorrect, delete (Ctrl+D) the HOME screen and reenter it as you would for a new client. Your client can obtain this information using the IRS First Time Homebuyer Credit Account Look-up tool (see First Time Homebuyer Credit Lookup Tool Helps Taxpayers Who Must Repay the Credit for more information). Enter it as a sale on the HOME screen, using the applicable foreclosure numbers. Do not use the field Date home ceased to be main home if not sold. See Pub. 523, Selling Your Home, for more information. What causes the 5405 to be produced? The 5405 will not print unless required. There is no way to force the 5405 to print when it is not required. A blank Form 5405 is available under Tools > Blank Forms. See Form 5405 Instructions for more information about repaying the credit. The deceased spouse's half of the remaining (unpaid) credit is forgiven. The surviving spouse's repayment obligation is then based on the outstanding balance after the forgiveness. In other words, the surviving spouse remains responsible for the surviving spouse's half of the credit. Example: Taxpayer A and B are married. They bought a home together in 2008 and claimed the credit on a joint return. They received the $7,500 credit and repaid $500 each year for 2010, 2011 and 2012. Taxpayer A dies in 2013. Are repayments waived? A. Taxpayer A’s half of the remaining credit is forgiven, and Taxpayer B now is responsible for only her half of the remaining credit, or $3,000. Now, Taxpayer B is required to repay only $250 a year, beginning with her 2013 tax return. Article has been viewed 8.8K times.